Thinking about a pressure cooker? It is just amazing how a small tip here and quick note there can help you get a better understand the jargon used by the manufacturers and take a better decision. This review is aimed to explain some common features of pressure cookers and also show why Kuhn Rikon Duromatic Pressure Cooker is a very good choice. It is a great looking, well designed cooker ideal for daily use. 18/10 stainless steel is the way to go! 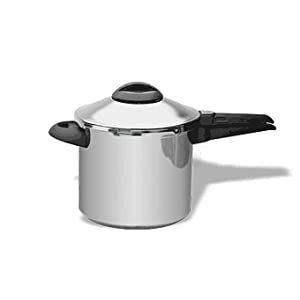 When you run into stainless steel pressure cookers, you will find that the most popular steel used is the 18/10 steel Obviously this has to be pretty good, because most cookers use this, but does that it really mean? The 18/10 is a terminology used to indicate the percentage of chromium and nickel in the iron. The newer terminology used today is 316 stainless steel which has 16-18% Cr, 10-14% Ni, and also 2-3% molybdenum. Interesting adding a small percent of molybdenum you add a corrosion resistance to the cooker, which is great. In other words, an 18/10 stainless steel cooker is tough, durable and corrosion resistant one which is ideal for your cooking needs. The Kuhn RikonDuromatic Top Pressure Cooker is a perfect example of the same. 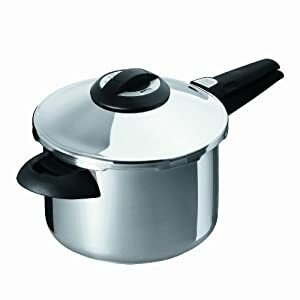 When it comes to pressure cooking, the real benefit of the technique is the ability to cook food in short time period. With shorter cooking time, you are not destroying a lot of nutrients in the food which makes it wholesome and nutritious. For this to work, it is imperative that you really get a very good conducting base that can transfer heat uniformly and rapidly. Aluminum is a much better conductor of heat than stainless steel, but is less resistant to corrosion. So, some of the best in class stainless steel cookers like Kuhn RikonDuromatic Top Pressure Cooker sandwich aluminum layer between steel ones. This gives you the best of both worlds. You may find many products that have the typical base and material. The key differentiators that really tilt the final decision are the other features. The spring loaded precision valve with integrated lid locking and 5 safety releases, you are looking at a very save and solid cooker. It is features that make it such a great product. Despite being a popular and well rated cooker, the gasket seems to be an issue. Some customers found that the life of the gasket is really poor and the higher price really adds to a lot of recurring costs. If you're looking for more details and specs about the products then you can go to their site, Kuhn Rikon. But if you are looking for great reviews from real buyers and real experiences, Amazon.com is the first place to visit. If you are really looking for useful tips to help you make the decision, it is the site to look at. Pros: Easy to use and clean. Do cooking in a fraction of time. Kuhn Rikon has a wide distribution network of authorized dealers selling certified products all across the US. You can visit their site to get more details about the dealers. You can pick the state and you have the list of dealers you can contact. However, if you are planning to go online, it is more convenient to purchase the cooker online itself. One of the best places to purchase it is Amazon.com. It is a great place where you can get great prices, terrific reviews and amazing deals.